Kythnos, Vryokastro, Building 5 durnig the excavation. Source: University of Thessaly Vryocastro Project website. 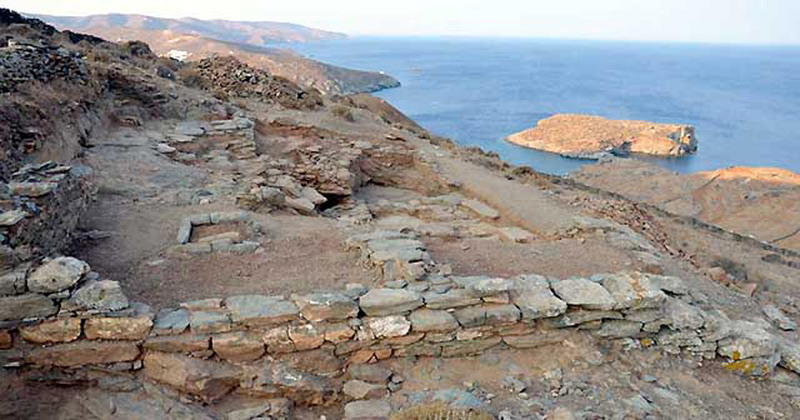 With settlement indications that go back to the Mesolithic Age (8500-6500 BC) , the Island of Kythnos in the Cyclades is of special archaeological importance. Among the archaeological sites currently under investigation, Vryocastro holds a special position as the Island’s main settlement during Antiquity. Spreading chronologically between the 10th c. BC and the 7th century AD, the ancient city (known itself by the name of Kythnos in antiquity) consisted of a residential area and acropolis with state buildings all surrounded by a fortification wall and two necropoleis, and had access to the sea, where traces of an ancient port still survive. Fieldwork has taken place in the form of a survey between 1990-1995 and a systematic excavation from 2002 onwards, both in the site’s terrestrial area and (from 2005) in the maritime area -the port and the sea. Research is run by the University of Thessaly in cooperation with the 21st Ephorate of Prehistoric and Classical Antiquities and the Ephorate of Underwater Antiquities. Resently, preliminary results were published regarding the latest finds through the 2013 season, directed by Alexandros Mazarakis Ainian. During 2013 research was focused on fully excavating a monumental building from the Hellenistic period, mentioned in the excavation reports as Building 5, with a view to comprehend its form, function and role for the city. With regard to Building 5, recent excavations led to the find that it was developed within two major architectural phases. The earliest dates in the mid-4th century BC, while major repair works seem to have taken place during the 2nd century BC. The point of the final abandonment of the building has not yet been determined but its use cannot span beyond the second-first century BC. What has been clarified is the building’s architecturel form. It had two floors, linked by a monumental staircase built in the middle of the building. The second leven seems to have housed an number of rooms with a more official-formal character: room A characterised by a ritual fireplace in the form of a grid, room Β-Γ whose floor was tiled and where part of the bedrock had been shaped (probably used as a space for meals), a third room Z of unknown use. A number of rooms also might ahave had wooden floors. A certain room ΣΤ might have served as the place where most vessels and objects in relation to the building’s use must have been stored. Here, food preparation must have taken place. Also, room ΣΤ was linked to the upper floor through the staircase. A small underground room H, access to which might have been possible through an opening on a wooden floor, must have been a storeroom for pithoi, and during the building’s earliest phase might have been linked with room Δ, which was also a storage area. Finally, room Δ might have been linked with room E and the central staircase. The building’s character remains uncertain. Its prominent position -near a Sanctuary-, its monumentality and the portable finds in it lead to the assumption that this was undoubtedly a state building which was also used for religious functions. The assumption that it was the “prytaneion” of Kythnos in the Hellenistic period remains a likely scenario that researchers hope to confirm with the completion of the excavation and material study.